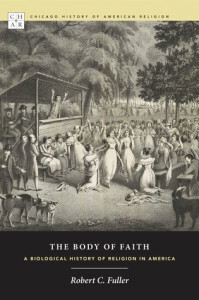 As someone who believes strongly in researching intersections of society as much as possible, I was intrigued when I saw Fuller’s Body of Faith available for eBook rental from University of Chicago. Let me pause quickly and praise this service. I’m located outside of a university system at the moment and acquiring appropriate resources for my research into American Protestantism is getting costly. To be able to rent eBooks for 30 days directly from UofC for the completely reasonable price of $7 is incredible. I hope more academic publishers move to this possibility. Fuller’s focus of the book is the biological realities of the body and they have both influenced and been influenced by religion throughout the American project. He starts with the colonists, moves onto the sectarian movements of the 1800’s (Shakers, Mormons, Oneida), and then deal with tent revivals and the like before briefly touching on 21st century movements. While the book makes some excellent points – especially about the physicality of tent revival services – I find it to be let down by its dependence on biological determinism. Instead of looking at how culture affected the body and cultural scripts affecting the body and those interact with religion, Fuller focused almost exclusively on biological adaption and deterministic patterns. I found myself raising my eyebrows in disbelief on several occasions as sweeping generalizations were made between the biological sexes without any real discussion of gender, for example. Saying that, however, there are some important insights for anyone studying religion, not only with America and American history but honestly throughout the world. Western Protestantism has tended to develop as a religion of stillness, one where sitting and listening or standing and calmly singing is appropriate. Pentecostalism and charismatic movements where the body is fully used throughout worship is often derided by mainline and even moderate Evangelical movements. What Fuller demonstrates in this book is that that division between stillness and movement has been around for most of American history. This is important for researchers looking at contemporary religiosity and the rise of mega churches, which are an odd hybrid of stillness and movement. Brownsville and Toronto, two of the first megachurches to spawn movements, encourage physical action as a demonstration of advanced holiness and closeness to God. Offspring of those churches may talk about worshippers raising their hands during praise and worship times but shy away from dancing. However, even the stillest of religious systems is still physical. Mainline churches may place more emphasis on verbal liturgy or talk patterns, but the act of taking communion is still physical. The act of standing or sitting for different activities is still physical. When we talk about mothers and fathers, we are acknowledging physicality of humans, same as when we pray for healing or the safety of soldiers. 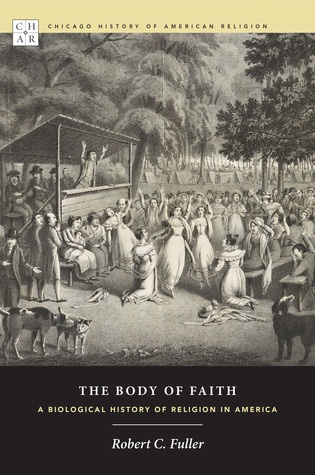 A better integration of a theology of the body is perhaps required for many congregations and some pastors and leaders would definitely benefit from reading Fuller’s work. In terms of researchers, this book would especially be beneficial to those looking in the origins and evolution of Mormonism, as Fuller devotes nearly all of his third chapter to it. As a novice to that conversation, I found his discussion about their relationship with alcohol and how it evolved particularly interesting. This book would also be of interest to anyone studying religion and sexuality, as he discusses several points key to that discussion. The Shakers, the Oneida Community, Aimee McPherson and Ida Craddock all get their due and while there is – as aforementioned – too much biological determinism for my tastes, the content of his argument is still worth considering. Overall, if your research interests fall anywhere where a discussion of physicality and American Religion would be useful, I’d ILL or rent this book. It’s clearly written and well cited. I wouldn’t use it as a teaching book for anything under MA level, but the material in it could be helpful to lecture preparation. Academic works are always, for me, read with hot beverages. This one got coffee. “Catch the Fire”: a brief explanation of the Toronto charismatic movement, as told by their own website. They incorporate physicality during worship to a heavy degree. As said above, I rented this book from the University of Chicago Press website for my personal research agenda. Academic, Coffee, History, Non-Fiction, Religion, Sociology, Sociology of Religion, U.S.